A few months back, I talked about some postcards I had received that once belonged to my grandmother. What I didn’t share then was the bag the cards came in. But now that has been remedied. As I stated in the earlier article, I believe that the postcards are from the opening years of Walt Disney World. And today, after much research on the bag, I can say with 100% confidence that I have absolutely no idea what year, or time period, this bag comes from. Yet, I am hopefully that this bag will get me into a closer range than I have had before. But Ryan, you might ask, how is that possible? You just said that you don’t even know when the bags were in use. Fear not devoted reader, this is where you come in. I am hoping that by posting an image of the bag that someone out there will recognize the design and be able to give me a more definitive time-frame than the one I have now. That is, at least, my hope. If not, well then we were all able to take a moment and reflect on a very cool, yet underappreciated, piece of Walt Disney World history. I LOVE the look of this bag. Although very much retro, the color scheme and stylized balloons are absolutely beautiful! That's what I've been thinking. They were found in a box with some articles, none about Walt Disney World sadly, dating around the early 70s, so that's what I have been running with. Well, that and Big Brian's history of WDW postcards. I agree with you about the style of the bag, when I first saw it I was taken aback. 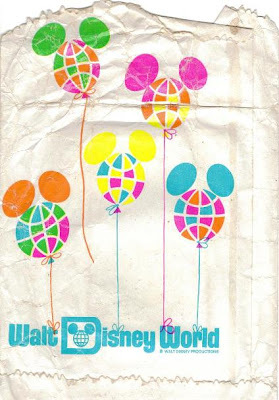 It seems so simple, and less busy than today's bags, but still conveys that great spirit of Disney.